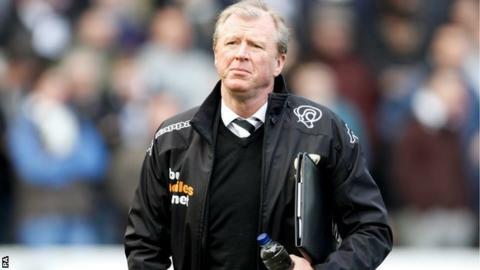 Former Middlesbrough manager Steve McClaren's first return to the Riverside ended in defeat for his promotion-chasing Derby County side. McClaren was warmly welcomed by Boro fans as recognition for a five-year spell which brought League Cup success and a Uefa Cup final appearance. But a well-taken second-half goal from Nathaniel Chalobah, his first for the home side, proved decisive. The defeat leaves Derby fourth, 11 points adrift of second-placed Burnley. But they have the same points advantage over Nottingham Forest in seventh and, with six games remaining, a play-off spot looks relatively secure. After a cagey start, Danny Graham had Boro's first real chance, but fired over from inside the box. Lee Tomlin then squandered a great opportunity for the hosts, firing straight at Lee Grant, but McClaren's side finished the half strongly with Lee Martin blocked by Kenneth Omeruo and Dimi Konstantopoulos palming away George Thorne's follow-up. As Derby continued to press after the break, Craig Bryson drilled a 20-yard effort straight at Konstantopoulos, Patrick Bamford headed a cross over and Andre Wisdom curled a shot just wide. Boro went close as a Chalobah through-ball sent Albert Adomah racing into the box, but he poked wide under pressure from defender Jake Buxton. The deadlock was finally broken on 69 minutes as Emmanuel Ledesma cut in from the right and threaded a ball in for on-loan Chelsea midfielder Chalobah to rifle a low shot inside the far post. Derby had a chance to level five minutes from time as Conor Sammon floated a free-kick to the far post, but a stretching Buxton poked wide. "That wasn't us today. We were below-par and that's been very rare. "We played at a low tempo and, although I thought we bossed that game in terms of possession, we lacked the urgency, penetration and ruthlessness we usually show and we got punished for it. And you could see it coming." "We played very well against a good side who are trying to get into the play-offs. It shows everybody that when we play like a team we can beat any team in this league. "The last four or five games at home we have played well but now we are scoring goals and that means you can get positive results." Match ends, Middlesbrough 1, Derby County 0. Second Half ends, Middlesbrough 1, Derby County 0. Nathaniel Chalobah (Middlesbrough) wins a free kick in the defensive half. Substitution, Middlesbrough. Curtis Main replaces Albert Adomah. Attempt missed. Jeff Hendrick (Derby County) left footed shot from outside the box is too high. Attempt missed. Emmanuel Jorge Ledesma (Middlesbrough) left footed shot from outside the box is high and wide to the left. Assisted by Jacob Butterfield. Attempt missed. Conor Sammon (Derby County) left footed shot from the left side of the box is close, but misses to the right. Assisted by Will Hughes. Substitution, Derby County. Lee Naylor replaces George Thorne. Attempt missed. Jake Buxton (Derby County) left footed shot from the left side of the six yard box is close, but misses the top left corner. Assisted by Craig Bryson following a set piece situation. Delay in match Emmanuel Jorge Ledesma (Middlesbrough) because of an injury. Albert Adomah (Middlesbrough) wins a free kick on the left wing. Substitution, Middlesbrough. Jacob Butterfield replaces Luke Williams. Substitution, Derby County. Will Hughes replaces Patrick Bamford. József Varga (Middlesbrough) wins a free kick in the defensive half. Foul by Luke Williams (Middlesbrough). Goal! Middlesbrough 1, Derby County 0. Nathaniel Chalobah (Middlesbrough) left footed shot from the centre of the box to the bottom right corner. Assisted by Emmanuel Jorge Ledesma. Attempt missed. Albert Adomah (Middlesbrough) right footed shot from the centre of the box misses to the left. Assisted by Nathaniel Chalobah. Attempt missed. Andre Wisdom (Derby County) right footed shot from the right side of the box is high and wide to the left. Substitution, Derby County. Conor Sammon replaces Johnny Russell. Substitution, Middlesbrough. Emmanuel Jorge Ledesma replaces Lee Tomlin.